Last-ditch efforts to keep an Oakland woman and her husband from being deported failed on Tuesday evening. Maria Mendoza Sanchez, a nurse at Highland Hospital, spent 15 years trying to get United States citizenship, but was unsuccessful. 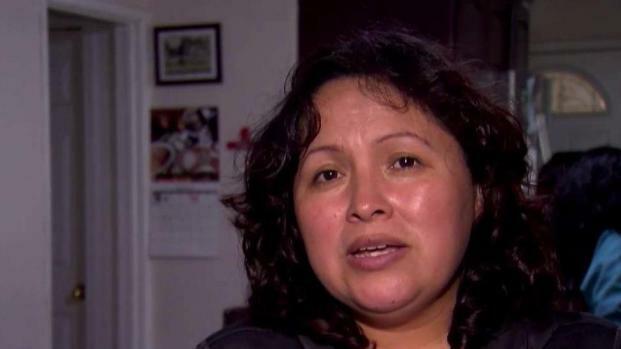 The woman and her husband were granted a stay of deportation that expires at noon on Wednesday. The couple spent Tuesday hoping to receive an extension so they could stay in the U.S. for another year to take care of their children and attend their youngest daughter's graduation. Having been turned down, though, Sanchez, her husband and their son will be forced to leave on a flight at 11 p.m. Wednesday. The couple's friends will look after their girls. An Oakland woman and her husband are being deported after 15 years of trying to gain citizenship . Pete Suratos reports. Twenty-three years ago, Sanchez illegally crossed the border with her husband and one of her daughters. They had two more girls and a boy. The daughter she brought with her to the U.S. can stay here because of DACA. Their son and two other daughters are citizens, with one just a year away from graduating from UC Santa Cruz with a degree in human biology. Their youngest daughter has a learning disability so Sanchez, seeking to pay for a tutor, became a nurse in the oncology department at Oakland's Highland Hospital. She recalled telling her child, "I work. You study." However, Immigration and Customs Enforcement said late Monday, "When we fail to enforce (immigration) laws, what message are we sending to the millions of people who respect that process and are waiting outside the US now for visas that will enable them to enter the country lawfully?" Sanchez countered that she hadn't broken any laws, but was ensnared in the illegal immigration crackdown. ICE officials might've sent the "wrong message" if she was a criminal "but I'm not even taking jobs," she said. "There's a shortage of nurses." Sanchez's coworkers rallied for her on Monday, calling for an end to the deportation, but the woman in question does not blame President Donald Trump. That said, "this law is affecting all immigrants," she admitted, "but I feel somehow Mexicans -- we've been targeted. I don't know why."